If you are having a problem controlling green algae in your goldfish aquarium and your first thought is to buy an aquarium snail like an apple snail, don’t. The first reason not to buy an aquarium snail and place it in your goldfish’s tank is that most aquarium snails prefer water temperatures that are about 5 to 10 degrees warmer than what your goldfish thrives in. The second reason is that goldfish are known to nibble on aquarium snails. You might ask yourself, how can a goldfish eat a snail? — a goldfish will eat the antenna of the snail, which will obviously kill these little guys.Another type of algae eater, the pleco, would be problematic in your goldfish tank too. Your best bet is to buy an algae scrubber and clean the algae off the sides of your goldfish tank. A routine water change will help as well. There are thousands of different species of algae that range from a microscopic single cell to strands of seaweed kelp that can resemble a plant. Green algae is a primitive aquatic organism that contains two forms of chlorophyll that converts energy from the sun into food in the form of sugars and lacks any true stems, leaves or roots. Certain single celled types of green algae can create ‘pea soup’ green colored water. Stringy types of green algae can create a blanket on the surface or cover rocks and plants. Algae found on aquarium glass and decorations can come in the form of film, spot and fuzz. Algae spores are everywhere in the world. 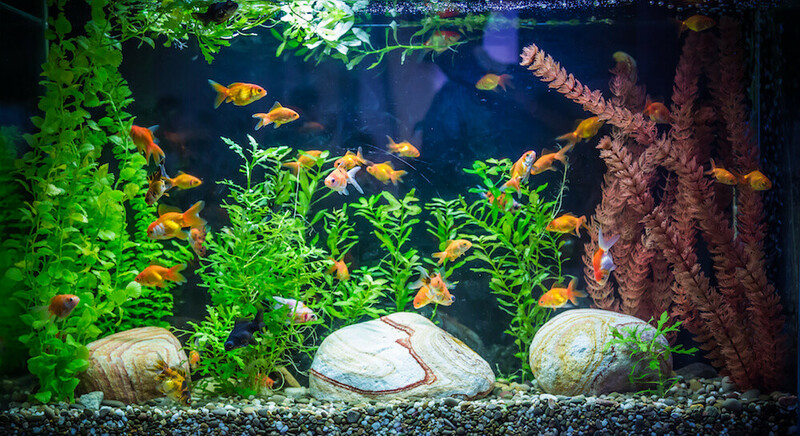 Algae can show up in your indoor goldfish by way of airborne free floating spores, through spores that live in water or through spores found in living organisms, including humans. Given the right conditions, these spores can grow into algae blooms. When there is an abundant amount of dissolved waste and nutrients in the water; the temperature of the water is warmer; the water receives direct sunlight or too much artificial light; an absence of algae eating fish or a lack of live aquatic plants. Some strains of algae are toxic but many are harmless but it’s difficult to tell with the naked eye which is and which isn’t. However, many types of algae that are commonly found on the sides of aquarium glass or on aquarium decoration and aquatic plants called film, spot and fuzz are not typically harmful. Physically remove the green algae with a net and algae scrubber. It is also a good idea to do a significant vacuuming of the gravel. Using chemical products should be a last resort since they can affect your aquatic plants or fish if you use more than the recommended dose. Remove the goldfish tank from any direct sunlight. Add living aquatic plants to use up extra nutrients and nitrates in the water. Catch algae early and remove it when it first appears. Green algae blooms when there are sufficient nitrates in the pond water and plenty of direct sunlight. The long hot daylight hours in the summer are ideal conditions for green algae to thrive. Just like the green algae in goldfish tank water, these algae outbreaks can come in many different forms and cause problems in your goldfish pond. What Are The Types of Pond Algae? The green ‘pea soup’ water conditions that cause algal blooms are single celled forms of algae. When this shows up in your goldfish pond, it is a sign of poor pond water quality. This happens in new ponds Poor quality water in a goldfish pond can be caused by excessive nutrients in the pond water due to over feeding, overstocking with fish or a lack of biological filtration.Blanketweed is a species of filamentous algae that resembles strings of thread or silk. In a goldfish pond, It will clog up the filters and air pumps, cover the aquatic pond plants that help produce oxygen. Some blanketweed in a goldfish pond is not a serious problem but it soon can become a nuisance in a well lit pond with excessive nutrients and a lack of aquatic plant life. Completely eliminating blanketweed can difficult due to its ability to adapt and become resistant to certain chemical treatments. 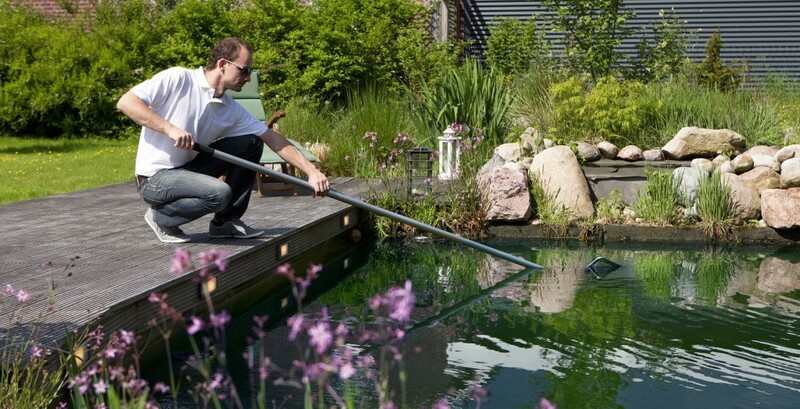 How Do You Remove Algae From Your Pond? To cope with an green algae bloom reassess your feeding regiment, and stocking levels. This usually mean you need to cut back on feeding. Add more aquatic plants or amphibious plants to out compete the algae for the nitrates in the water. It’s important to note though, at night time, aquatic plants compete with your goldfish for the dissolved oxygen in the pond water and during summer months there can be low oxygen levels. Waterlilies that float on the surface of the pond will shade the water and discourage green algae blooms from growing. an ultra violet light pond water clarifier takes pond water recently passed through a pond filter into its own tube opening that contains an ultraviolet light . The ultraviolet light helps breaks down all the algae cells in the ponds water by continuously circulating water past its ultraviolet light. Passing the water first through a filter helps keep other particles out that might shelter the algae cells or clog the tube of the ultraviolet clarifier. 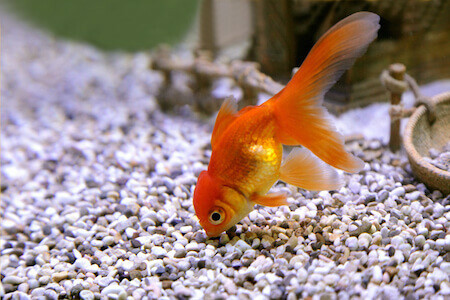 Barley, lavender, wheat, linseed, and oil seed bags are often used an algaecide in goldfish ponds. Barley straw bags are considered to last the longest and is recommended over other products. The decomposition of Bbarley straw releases compounds that inhibit the growth of certain types of algae. It doesn’t kill the existing blanketweed but keeps new algae from growing. If you find these bags to be an eyesore, try a barley water clarifier. Pond algae magnets break up the calcium carbonate in goldfish pond water which then weakens the the cell walls of blanketweed. Since blanketweed can become resistant to treatments, it is recommended to cycle the pond algae magnet in and out of the pond for a few weeks at a time. Electronic units act similar to algae magnets by creating a static magnetic field that controls blanketweed. These too should be used intermittently. However, high-end models will periodically change the polarity strength which makes it hard for the blanketweed to adapt to the constantly changing conditions. Electronic blanketweed controllers are safe for use in goldfish ponds that contain aquatic plants since aquatic plants have thicker cell walls. Chemical algae control can be used in combination with these other treatments and be used intermittently so the algae doesn’t become resistant to any one treatment. If you choose to use chemical treatments, be careful to follow the recommended dosage or you risk killing your fish. For me to get ready pond for the winter implies review of holes and in the event of hole utilization of pond, Pondpro2000made me loose for quite a while. The extra quality of this is harmless for gold fish. It stops algae too. If I back off my feeding a lot, will my goldfish eat the algae? I only have some on my gravel right now and I’m hoping I can feed less if they’re going to eat algae all the time. It seems like a good source for the wild carp so I would think it can be a good source, at least in part for aquarium kept domesticated versions. Thanks so much!!! Yes and in doing so, the less rotting food in the tank to raise the nitrate levels, the less algae that will grow. The method you are suggesting is the healthiest way to control algae. This helped me, my goldfish has the fuzz or film you talked about. Now i know that its commonly not harmful. Can answer more questions if so… Please answer on why my other goldfish died but the other one is still very active and looks fine.